For one family that lost their house to the North Bay wildfires, they are relieved to at least have found one missing possession: their dog, Izzy. 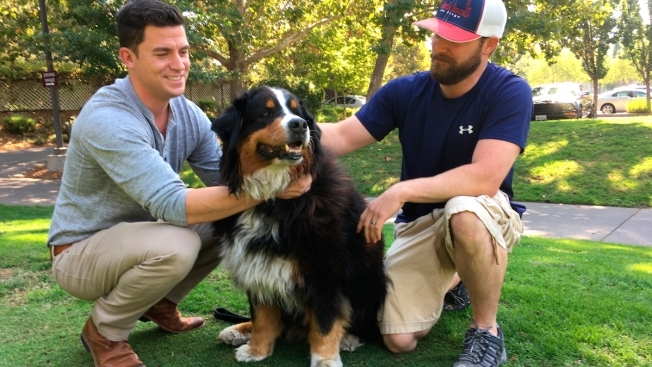 Jack Weaver and his brother-in-law hiked to the Santa Rosa street where his parents' home once stood, looking for their Bernese mountain dog. As they called for Izzy, amid destruction and devastation, she came walking out of the debris, covered in ashes and smelling like soot. Weaver, who was filming the scene for his parents, captured the moment on his phone in a video that's gone viral on Facebook, providing a rare bit of good news amid endless scenes of severe destruction. "She was very happy to see us," Weaver said of Izzy, a 9-year-old Bernese Mountain Dog. "She's such a brave dog. She was panting a lot and clearly stressed. But she was not frantic or anything." A veterinarian said Izzy was fine, likely insulated from the fire's intense heat by her thick fur coat. In the frantic race to escape in the middle of the night, the Weavers and many others were forced to leave behind their pets because they couldn't be found or there was simply no time to get them. Izzy ran off when the Weaver's parents were evacuating. His mother was devastated. "She just lost it," Weaver said about his mother. "She went from being devastated about losing her home to being the happiest person I've ever seen. I couldn't get home fast enough. She was really, really happy ... She's still shaken up by the whole thing, but she's in much better spirits now that Izzy is at our house." The 9-year-old dog has survived cancer twice. She has now also lived through a massive wildfire.